I may need to have a new series called “Felting Fanatic.” Since raiding my mom’s stash of yarn over the Christmas holidays, I’ve been so excited to try making some felted projects. The first was a felted basket to my knitting. 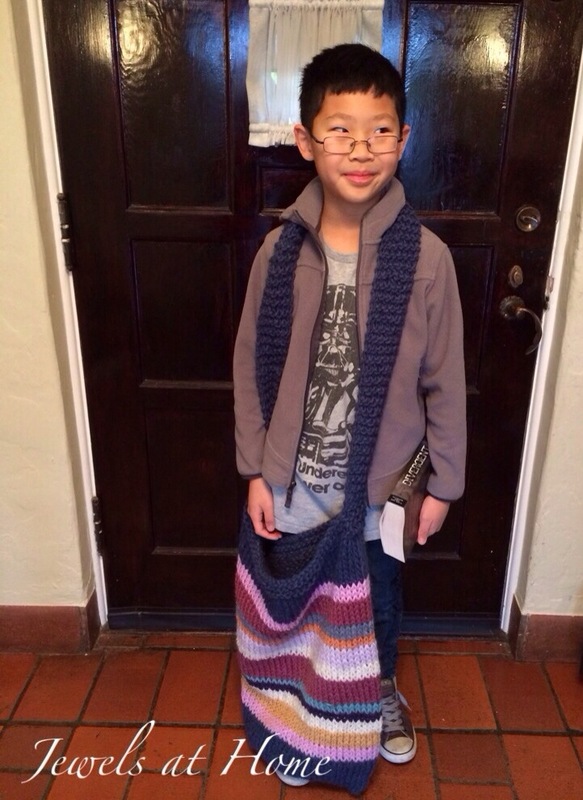 Steve calls it “Knitting Inception,” because of the yarn within the yarn thing… he’s a bit quirky that way. The next project was this felted shoulder bag. 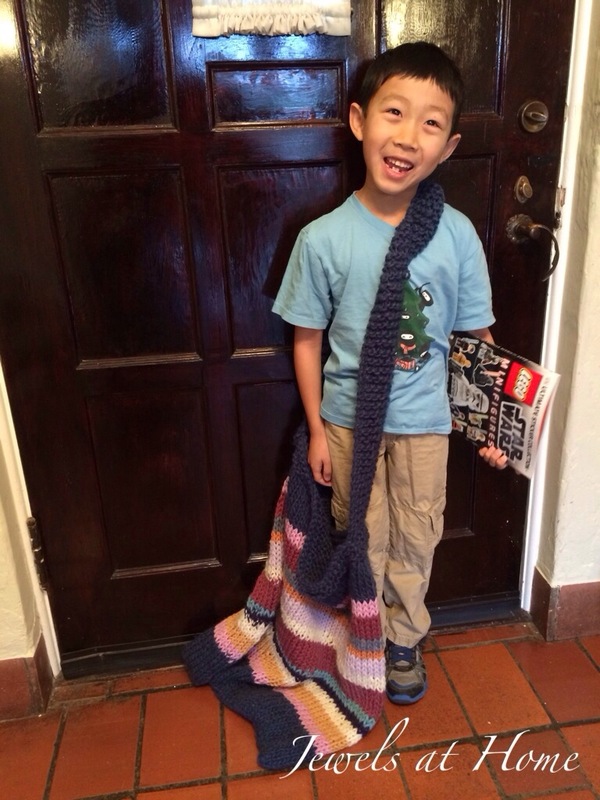 I was having a lot of fun with the big needles and chunky yarn, because everything came together so quickly. I had learned a little bit about the proportions from making the basket, and so I adapted my plans for this bag a little bit. It’s a simple shoulder bag. The main color is dark blue, and I used a mix of many colors for the stripes in between. Like the basket, I was able to mix different types of yarn by doubling or tripling the ones that were thinner. Like with the basket, I knit on my chunky needles with a gauge of 3 stitches per inch. 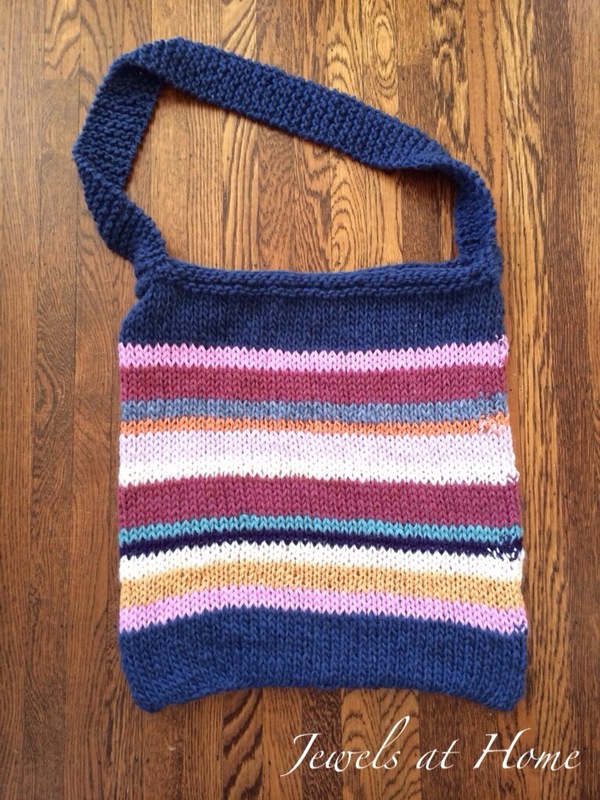 I cast on 90 stitches and knit in the round with stocking stitch until the bag was 22″ high, finishing with 4 rows of garter stitch at the top of the bag, so it wouldn’t roll over. The shoulder strap is 8 stitches wide in garter stitch, and I sewed this onto the top outside edge of the bag and started as 47″ long. To assemble the bag, I sewed the handle onto the sides of the bag, overlapping the pieces by about an inch. I used a whip stitch to close the bottom of the bag from the inside. 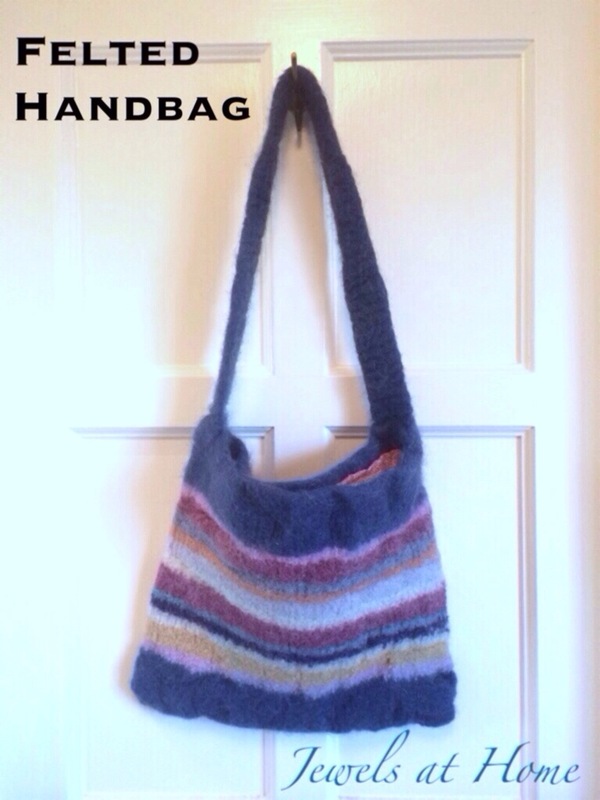 Before felting, the bag was 21″ wide by 22″ long, and the handle was 47″ long. It was comically enormous, as the boys modeled. K said, I should go into business making bags for giants. If I ever meet a giant, I’ll think about it. Thankfully, the finished bag is a much more comfortable 13.5″ wide by 11″ high, and the strap turned out about 30″ long. As a finishing touch, I made a lining for the bag out of some vintage fabric, also from my mom’s stash. 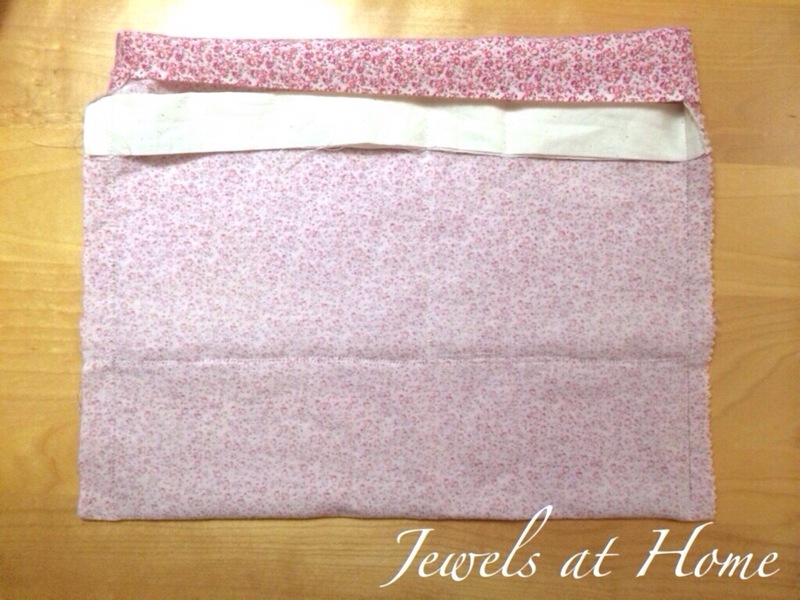 I sewed a simple rectangular lining, with some pockets on one side. 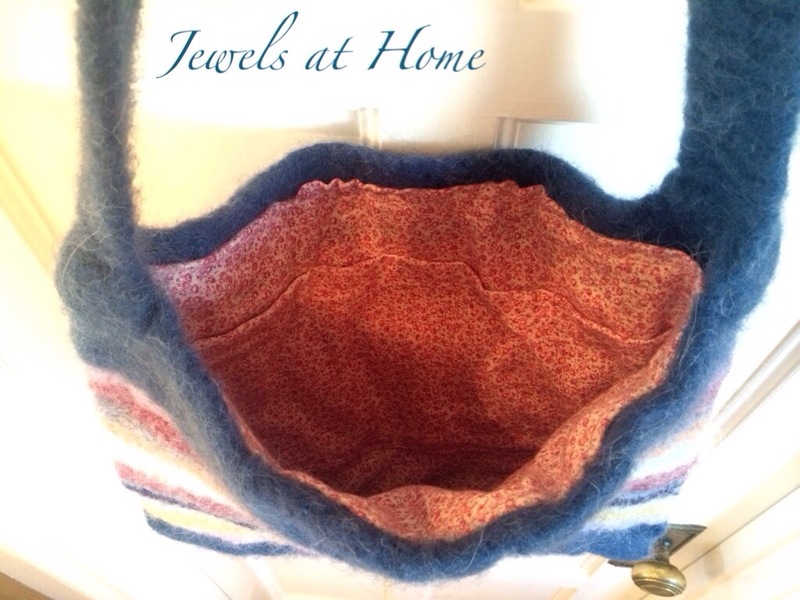 I then folded down a hem along the top and hand-sewed it into the felted bag. I’m excited to use my new one-of-a-kind bag with all its fun colors!